The Internet of Things (IoT) has grown rapidly over the past few years as just about every type of device is getting connected to the cloud. Whether monitoring factory assembly lines, controlling the music and lights in your house, or tracking your health, IoT is everywhere and continuing to grow, giving us new insights into trends, habits, and future predictions. When you think about big impact uses of IoT, there are few better examples than the production of food. 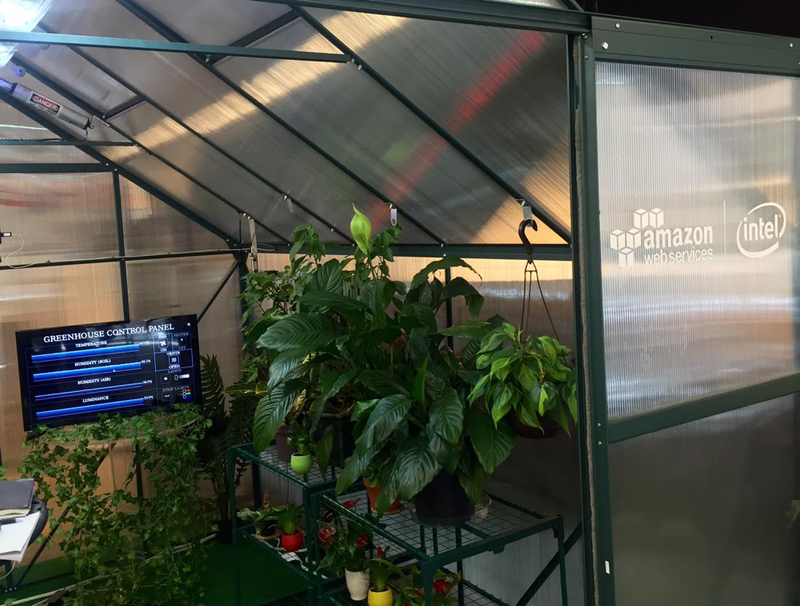 To bring this concept to life, we brought the AWS + Intel Smart Greenhouse to the AWS Pop-up Loft | NY, where guests have been able to explore the self-contained, automated greenhouse, see the latest demos, and participate in hands-on workshops about the technology. The Smart Greenhouse uses multiple sensors, powered by the Intel Edison board, to pull valuable metrics every second such as temperature, soil moisture, humidity, and luminosity. 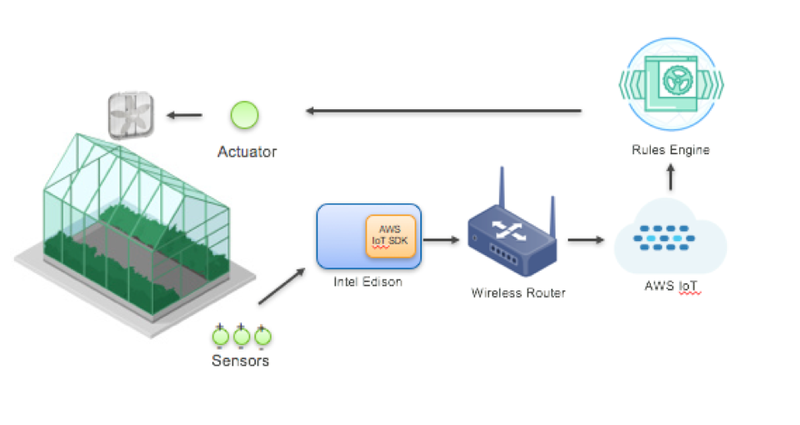 Streamed in real-time over the Intel Edison’s built-in Wi-Fi, this data is processed through our AWS IoT rules engine, where it looks for conditions that would typically require manual intervention. Is the plant soil too dry? Fire up the misters. Is the greenhouse temperature too high? Turn on the industrial fan to cool it down. Is it too dark for plant growth? Adjust the strength of the growing lights. Ultimately, the greenhouse is just a small-scale example of what is happening around the globe at a much larger scale. Farmers are deploying IoT sensors in their fields to pull soil samples and other conditions in real time that show how their crops are doing at massive scale. Farmers are also experimenting with using drones and self-driving tractors to automatically tend to the crops. This means farmers can potentially produce higher quality produce, at a reduced cost, and with a greater yield. That’s a welcoming message to our growing planet! 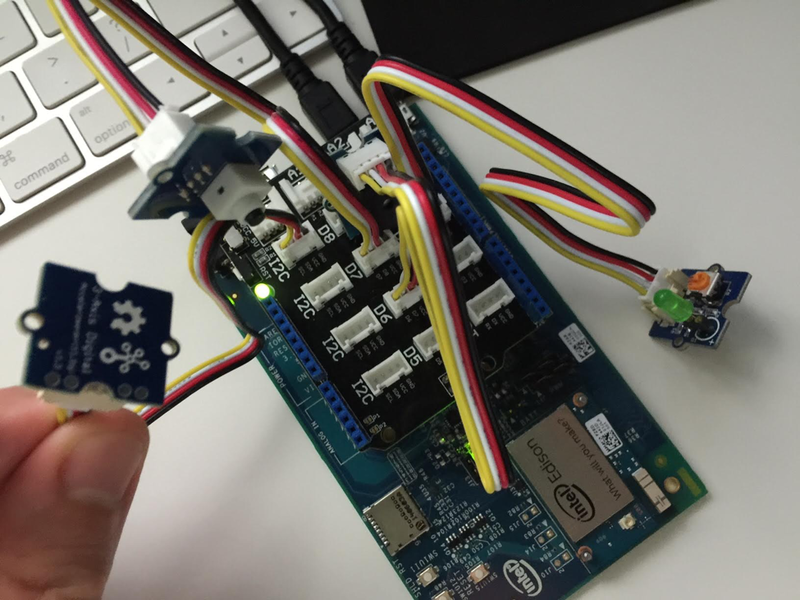 During a full-day, hands-on workshop at the AWS Popup Loft | NY, attendees configured their own Intel Edison device and connected it up to the AWS IoT service. 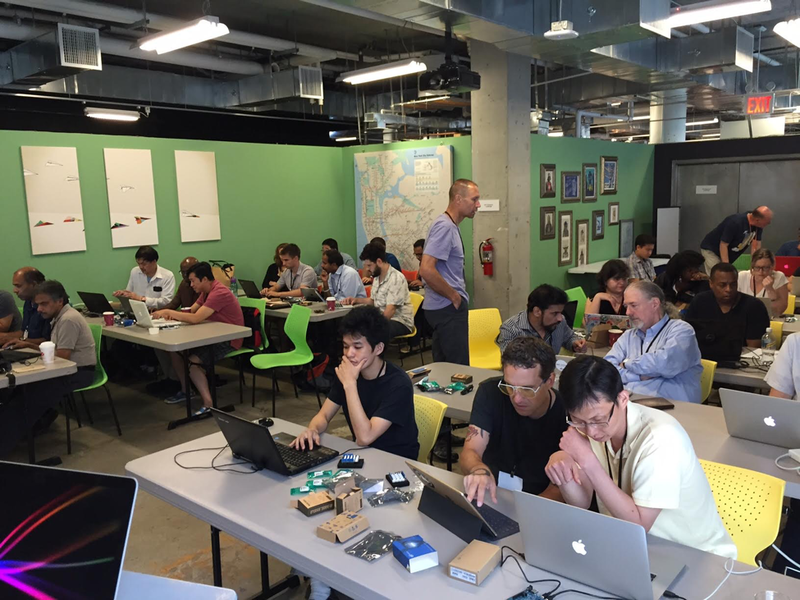 Each group was provided with an Intel Edison board and an assortment of parts (LED lights, accelerometers, buzzers, and switches). Groups were guided through assembling the device and configuring the Wi-Fi and local user. Using Node.js and a handful of helpful libraries such as Johnny-Five and the AWS IoT SDK, the devices soon were receiving data and transmitting it real-time into the AWS IoT service. Each movement of the devices was being captured through a three-axis accelerometer and sent over MQTT to the AWS IoT rules engine. The IoT rules engine makes it easy for you to use simple SQL statements to query data in real time as it streams and to take action based on the data. In our workshop, we queried all of the temperature data and passed the values to an Amazon Kinesis stream. 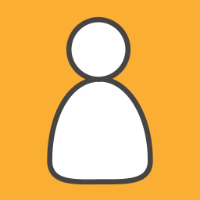 Kinesis was set up with an AWS Lambda event that populated the data into Amazon DynamoDB. This gave attendees the chance to have hands-on experience with multiple AWS services during the class. In the real world, you could simplify this setup because the IoT rules engine integrates seamlessly with a wide range of AWS services. 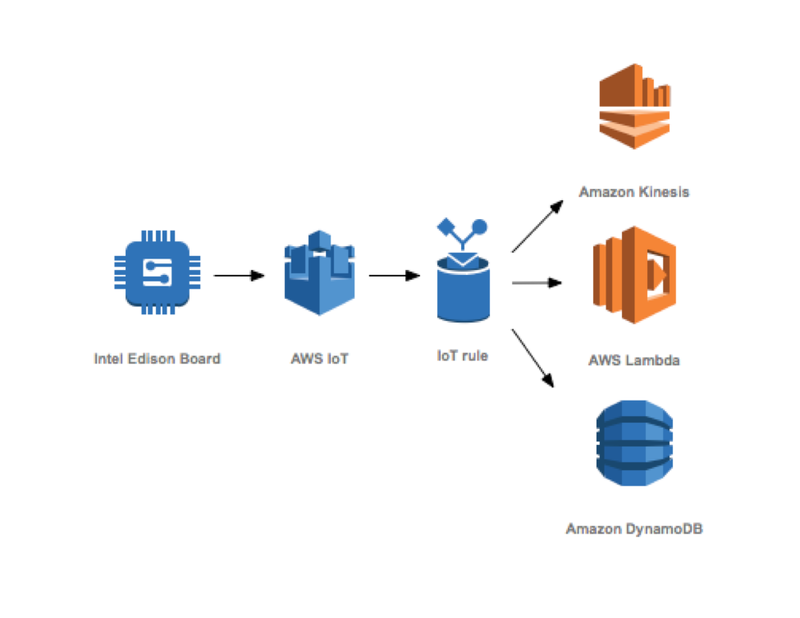 For example, you could have the IoT rules engine write directly to Lambda, DynamoDB, and Kinesis at the same time, as shown in the following illustration. At the end of the day, attendees had the opportunity for hands-on exposure not only to the physical hardware, but also to many of the AWS services that provide added benefit when used in conjunction with IoT. IoT is about more than just collecting data. It’s also about being able to analyze data at scale and make intelligent decisions. By using the IoT rules engine, you can easily leverage the power of Amazon CloudWatch, Amazon DynamoDB, Amazon Elasticsearch Service, Amazon Kinesis, AWS Lambda, Amazon S3, Amazon SNS, Amazon Kinesis Firehose, Amazon SQS, or even republish the message to another MQTT topic. This opens up the opportunity to make smarter decisions and take more advanced actions on your events. IoT technology is still in the early stages, but growing fast. It’s exciting to see not only the billions of IoT devices coming online, but also how the barrier of entry for building advanced IoT devices has been lowered. No longer do people have to worry about how to process enormous volumes of messages emitted from their devices. Instead, they can focus on what their device does to save lives, to improve food quality and production, or maybe just to know the right lighting conditions for relaxing on the weekend. Feel like giving it a try? Check out Hackster.io’s Smart Greenhouse project for parts and code to build your own!